Our Old Mates, fresh from a visit close to the ‘Volga,’ the ever reliable Tom Langham along with his long standing conscripts from middle England gave us an evening of stupendous musical renditions last month that was almost faultless apart from one slight bash in the gonging of Emily’s gong. A masterfully handpicked programme featured their niche market of tunes, mainly from the 20’s and 30’s delivered with the polished panache that Dove audiences have come to expect from these unassuming, minosonic minstrels of great repute. Tom again magnificently demonstrated his almost unrivalled encyclopaedic knowledge of, along with his obvious great affection for his subject matter. 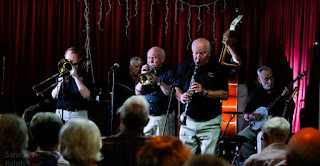 How fortunate we all are to be assured of their two appearances at the Village Hall in May and November of 2019 not forgetting Tom’s solo visit to appear alongside Enrico Tomasso’s in the Awesome Six in July next year. The occurrence of our Christmas Concert, which luckily will take place on a Saturday for a change this year, will once again be in the safe hands of the vastly experienced and entertaining Harlem Hot Stompers on Saturday 29th December 2018. Their line-up will feature the firm as a rock bass playing of Dave Parr with his string and brass basses, Fred Boggan laying down a strong and steady beat for the rest of the chaps to follow from behind his percussion kit with the boss, paymaster and leader completing this purposeful rhythm section with his sympathetic guitar and banjo playing. On the front line we will see Mike Pembroke, the band’s latest recruit with his trombone; the clarinet will be put through its paces by Dave Thomas and the ever resourceful and versatilical Bill Smith will show us his mastery of the harmonica, trumpet and vocal refrains. Their tuneful music will be delivered with that extra sack full of Festive Cheer for one and all to enjoy.